What a magical day that was the weather had us snuggled in close we were watching and enjoying and sensing the invisible spirits smiling as once again our kumu and her kumu and her students and all the invisible ancestors shared the joy of hula. 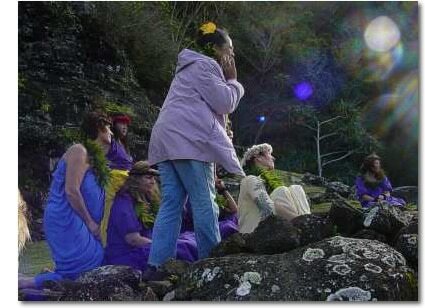 This shot captured the purple energy floating in the air and we felt the eternal mahalo that we are allowed to be blessed by this a’ina of Kauai. How lucky we were on this Valentine weekend to feel the love.